At the start of June the number of men across the world required to wear tailored clothes to work shrank considerably when the investment bank JP Morgan revealed its new “business casual” dress code. The rationale is that because JP Morgan’s clients don’t tend to wear suits neither should its 237,000 workers. Whether or not one applauds the bank’s move, and I suspect that even casually dressed clients like to see their bankers dressed formally, it provokes an obvious question: What the hell is “business casual”? 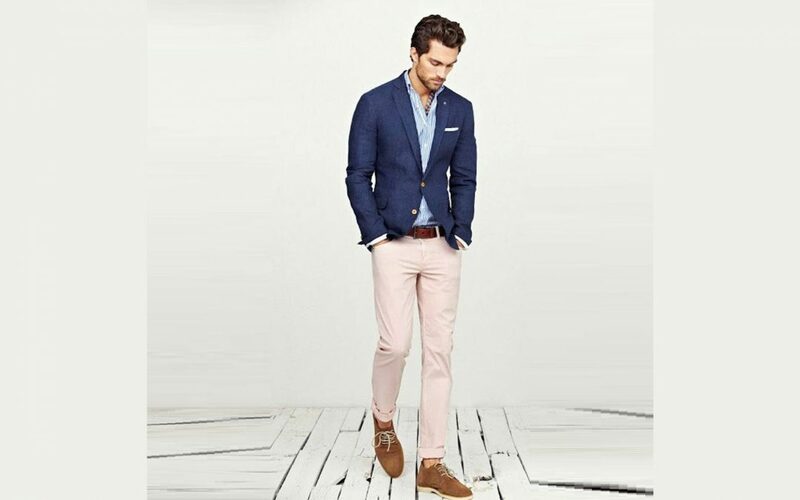 The basic ingredients, which account for the dress code’s distinctly American flavour, are a navy blue blazer, a pale blue shirt, a pair of khaki chinos and leather shoes. How can a man distinguish himself when the tools at his disposal are so bland? As ever the first rule is that all the clothes must fit. No matter their price a pair of casual trousers should be altered so that they have turn-ups that kiss the top of the shoes. Shirts should also fit well, particularly if they’re rarely going to be worn under a jacket, and shoes should be leather-soled loafers or derbies in brown suede or leather. As for the jacket, embrace the casual spirit with brown buttons and patch pockets. It shouldn’t look like a suit jacket, but it could be double-breasted. Needless to say all these elements will be hugely better if they’re bespoke. Perhaps go for some thirties-style trousers in tobacco-brown Irish linen, or khaki cotton. Upgrade to wearing custom-made button-down shirts, and consider ordering a patterned blue jacket with brown horn buttons and patch hip-pockets. And if you’ve got a rebellious streak then flout the rules by wearing a knitted tie.